This item will ship in 7 - 10 Business days. 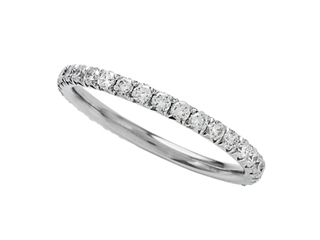 The impressing Round Diamonds French Pave Eternity Band, available in a range of metals including 18 kt Yellow Gold, 18 kt White Gold and 18 kt Pink Gold. This amazing design is set with 34 stones 0.70 carats pave set Round Brilliant Diamond G color VS2 clarity. This product measures 2.00 wide.